Searching for a new Chrysler, Dodge, Jeep, Ram for sale near Georgetown? 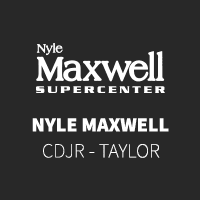 Look no further than the wide range of models in stock now at Nyle Maxwell CDJR of Taylor! You'll find everything from the Chrysler Pacifica, perfect for taking the whole family to a Taylor, TX park, to the equipment-hauling RAM 1500. When you find a model that piques your interest, contact us to schedule a test drive in Taylor! Why Shop with Nyle Maxwell CDJR of Taylor? If you think it's time for the next steps, our finance department will guide you, step-by-step, as you work to secure a loan or create your ideal payment plan. To get started from the comfort of your College Station home, you can apply for financing online. We look forward to helping you get behind the wheel of a brand new Dodge Journey or Jeep Grand Cherokee!